Get Your Signed Copy of CF Alive, Just 1 Cent! The CF Alive book launched with a big splash at Adobe CF Summit. Now I want to spread the CF Alive message to as many CF developers and managers as possible so I came up with this crazy 1 cent offer! 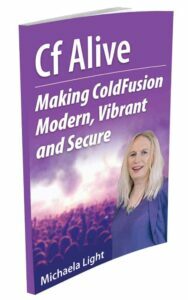 I'm mailing you a 220-page book, “CF Alive: Making ColdFusion Modern, Vibrant and Secure” (that retails at $14.95) for 1 cent. Yes, this book is 1 cent, and all you pay is $9.95 Shipping & Handling US or $24.95 International anywhere in the world.